Aerial view down on 2nd Marine Division cemetery on Tinian Island. 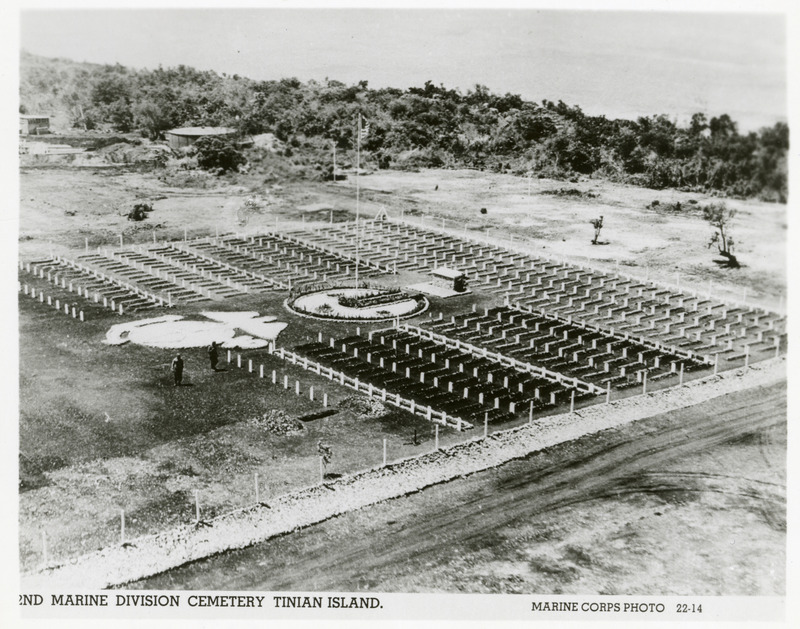 Official caption:'"2nd Marine Division Cemetery Tinian Island. 105 mm Howitzer Motor Carriage/ Priest crewman looking through telescope during training exercises at San Luis Obispo, California on 14 March 1944. 868. 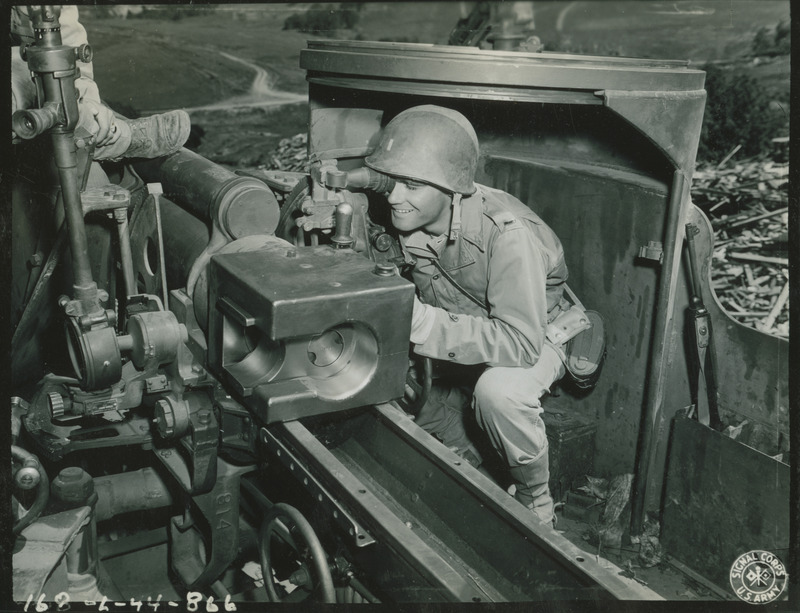 105 mm Howitzer Motor Carriage/ Priest crewman looking through telescope during training exercises. '3-14-44. DuTiel. 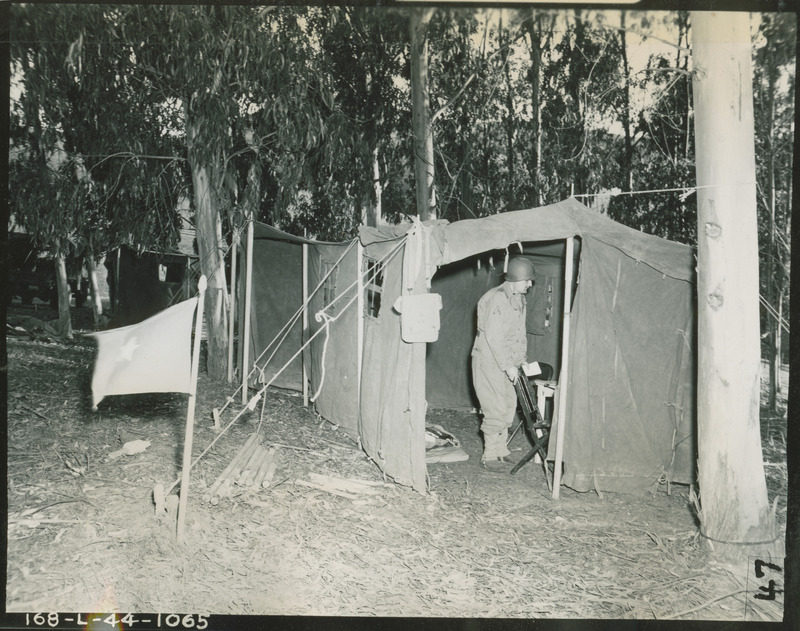 2nd Lt.
323rd Infantry Regiment General's tent during training maneuvers at San Louis Obispo, California on 28 March 1944. 993. 323rd Infantry Regiment General's tent during training maneuvers. '3-28-44. Hussey. 81st Infantry Division 105 mm Howitzer Motor Carriage/ Priest troops preparing 105mm shells to use during training exercises at San Luis Obispo, California on14 March 1944. 81st Infantry Division 105 mm Howitzer Motor Carriage/ Priest troops preparing 105mm shells to use during training exercises. "3-14-44. 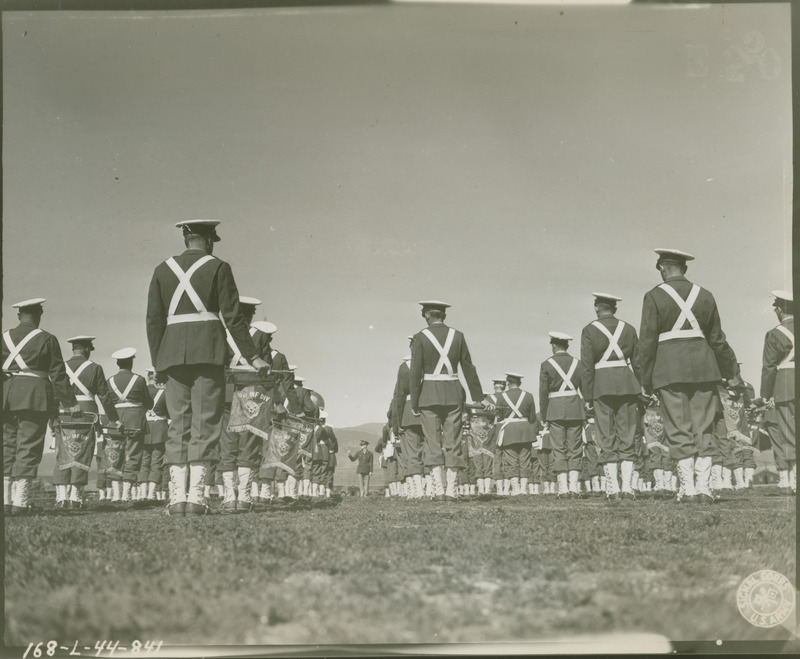 81st Infantry Division band playing during ceremony at San Luis Obispo, California in 1944. 843. 81st Infantry Division band playing during ceremony. 'The cameraman gets a shoetip view here of the 81st Div. 81st Infantry Division officers at reviewing stand at San Luis Obispo, California on 10 March 1944. 852. 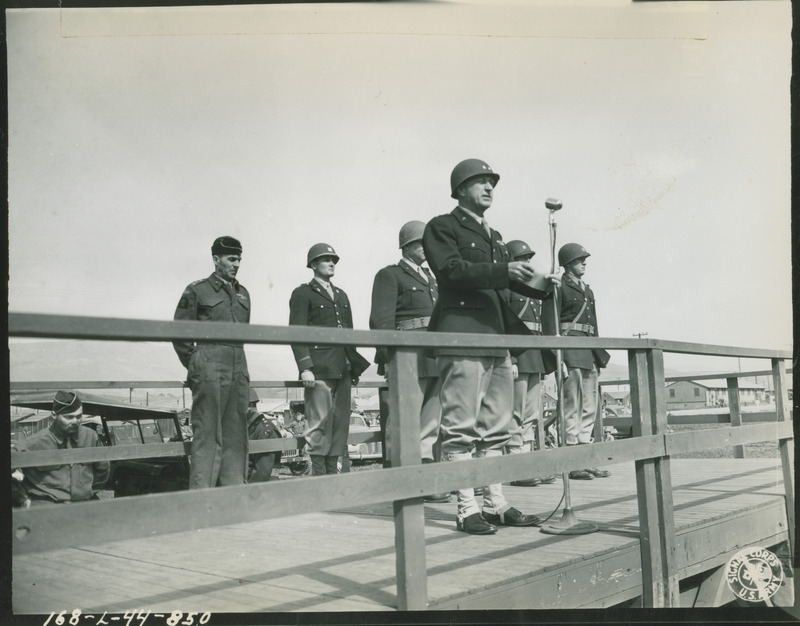 81st Infantry Division officers at reviewing stand. '3-10-44. Cye. 81st Infantry Division officers at reviewing stand at San Luis Obispo, California on10 March 1944. 853. 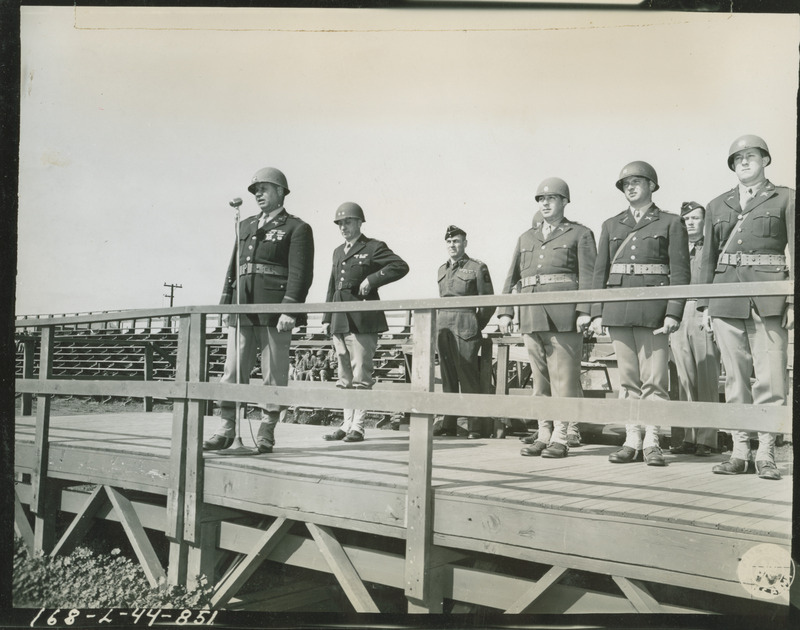 81st Infantry Division officers at reviewing stand. '3-10-44. Cye. Colonel Dark addressing 81st Division Rangers. 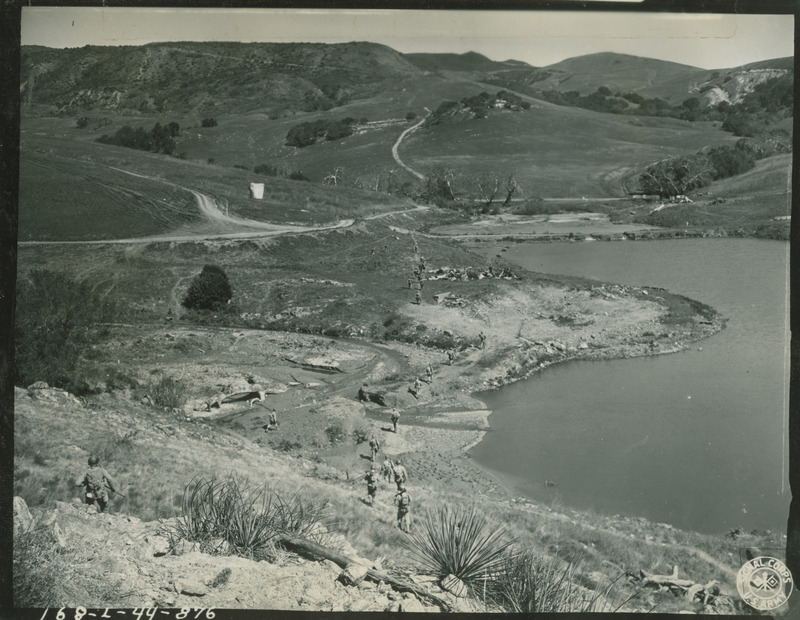 81st Infantry Division servicemen marching throughout California landscape during training exercises at San Luis Obispo, California on14 March 1944. 878. 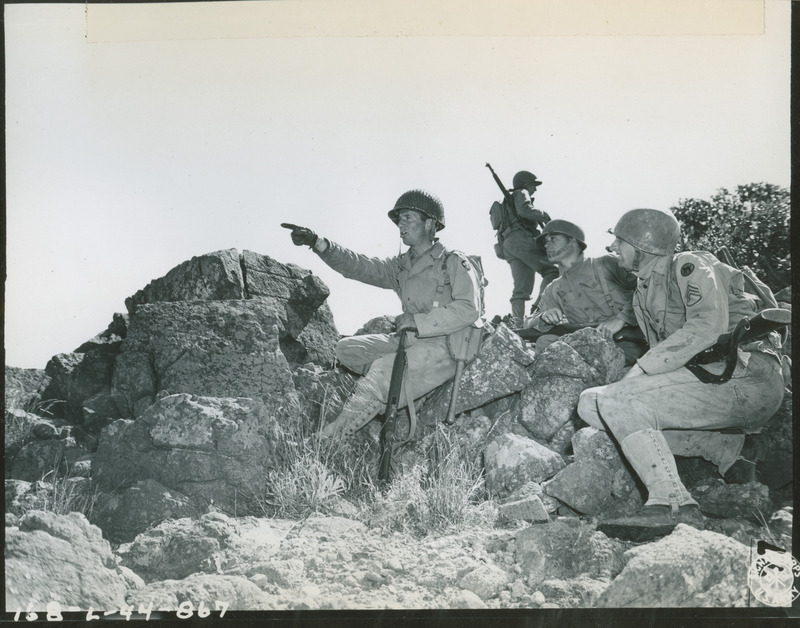 81st Infantry Division servicemen marching throughout California landscape during training exercises. '3-14-44. Ecklund. 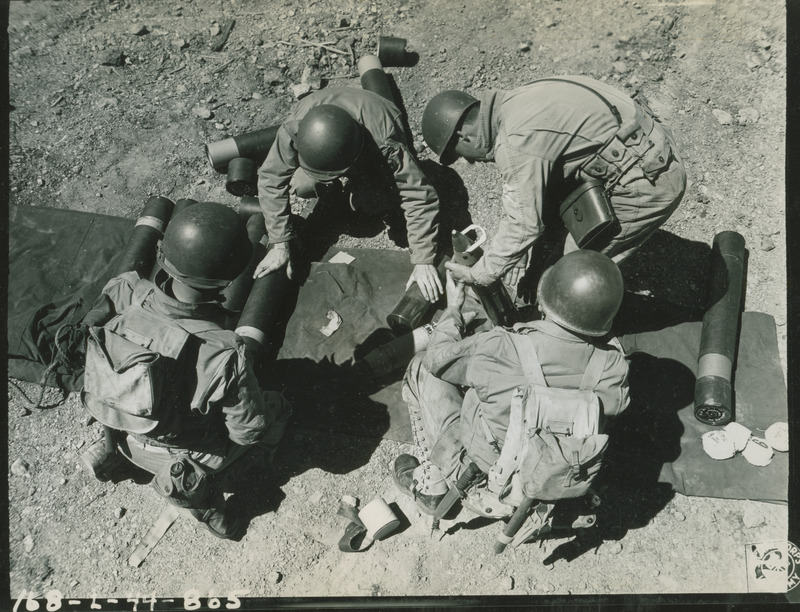 81st Infantry Division soldiers during training exercises at San Luis Obispo, California on14 March 1944. 869. 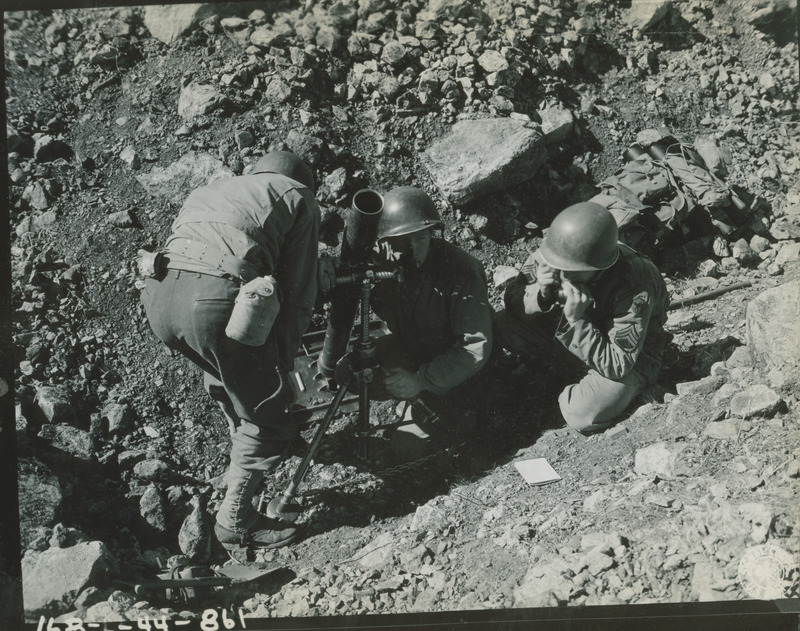 81st Infantry Division soldiers during training exercises '3-14-44. Paik. Lt. James Ryan, T/Sgt Wm. 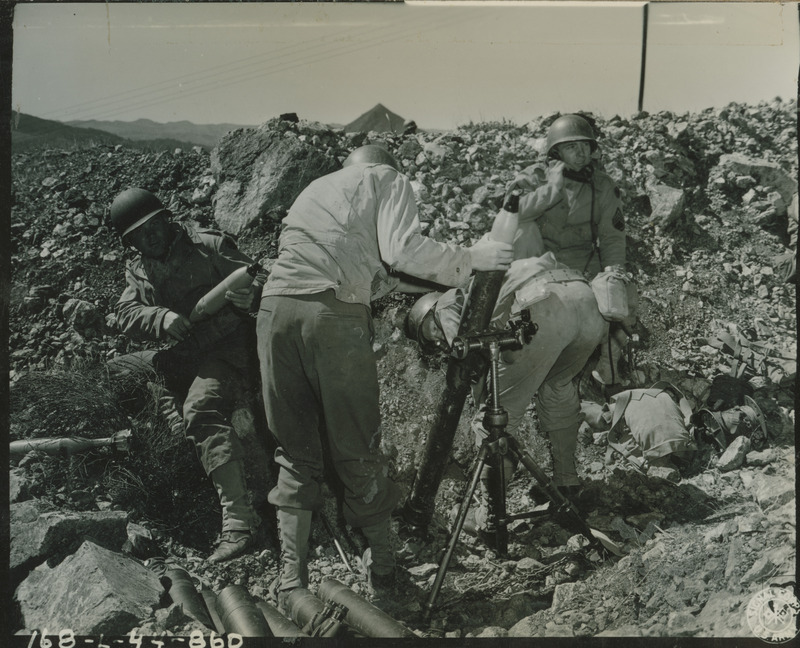 81st Infantry Division soldiers firing mortar during training exercises at San Luis Obispo, California on14 March 1944. 862. 81st Infantry Division soldiers firing mortar during training exercises. '3-14-44. Sharetts. Pvt H.
863. 81st Infantry Division soldiers firing mortar during training exercises. '3-14-44. Barry. 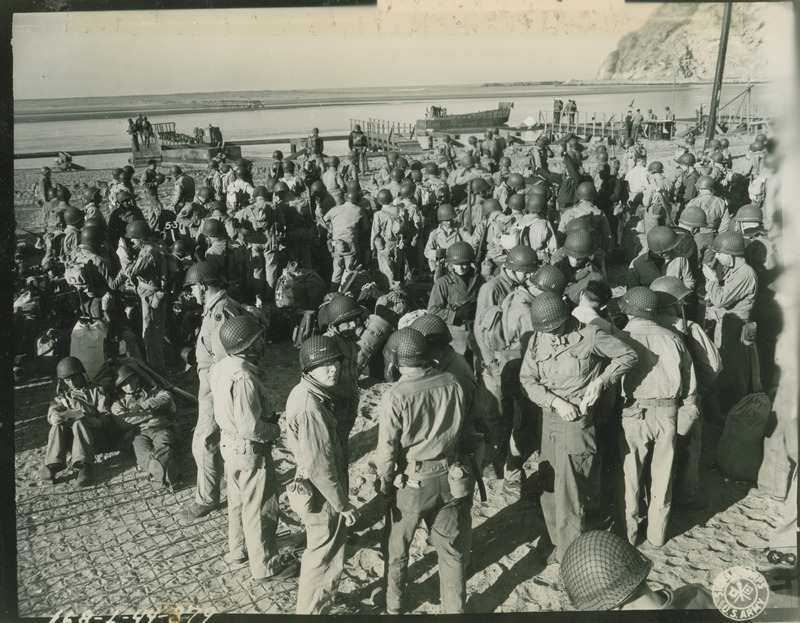 81st Infantry Division soldiers prior to boarding LCVP's during amphibious training exercises at San Luis Obispo, California on15 March 1944. 880. 81st Infantry Division soldiers prior to boarding LCVP's during amphibious training exercises. '3-15-44. DuTiel.